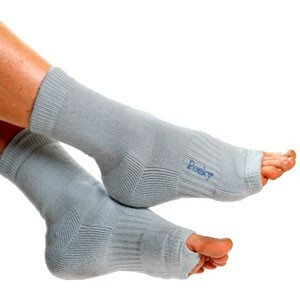 Peeky® L U X E is the ultimate in toe-curling nirvana, made from 85% Italian cashmere & silk. For added decadence, we used the cashmere & silk to create a plush cushion along the bottom of your foot - a rarity with such luxurious yams! Go ahead... reward yourself with much-deserved pampering. Peeky® L U X E is an affordable luxury you deserve & a perfect gift for that hard-to-buy for friend or relative! Perfect for pedicures, travel through airport security, a quick polish change after a bubble bath, or snuggling into bed - instead of wearing overheating socks & digging them out the next morning. 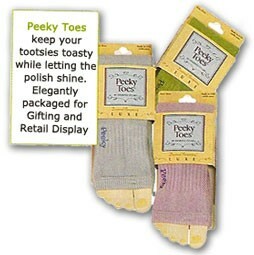 Let your feet breathe & give your tootsies some wiggle room! Quality engineered with arch support , plush terry cushion along sole of foot, and a comfortable single toe thong to hold the sock in place. Embossed with "Peeky" - so you know you are getting the best in luxury. Throw your Peekys® & flip flops into your work bag for that lunch-break-pedi or pop into your gym bag for after a spin class! Peeky® L U X E care: Hand wash or in a lingerie bag on gentle cycle with like colors. No bleach. Lay flat to dry. *Patent pending.